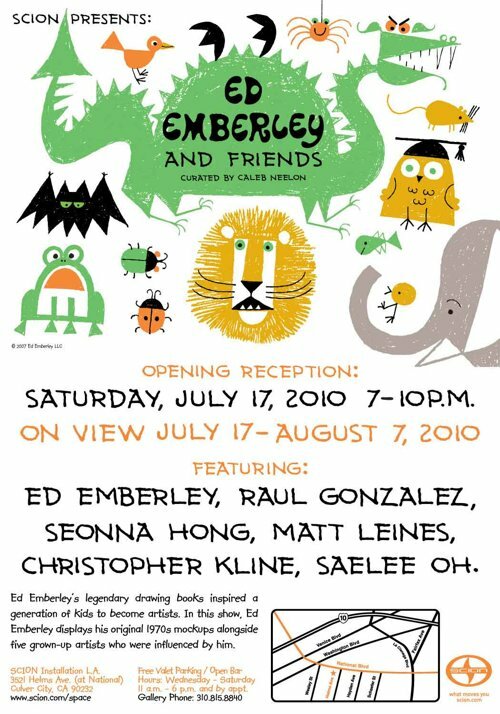 When I was little, I had a bunch of Ed Emberley drawing books that I thought were the coolest things ever. I am pretty sure my Grandma got them for me, since she was always bringing me good stuff from her Hadassah trips to museums: great women in history coloring books, Edward Gorey tote bags, etc. 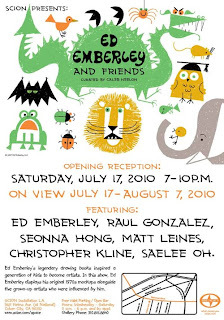 Emberley's Thumbprint books were my favorites and inspired my ad exec neighbor to create a campaign for Zippy's, the popular Hawaiian restaurant chain, using their iconic orange logo and local kids drawing on them. I have not been able to dig up video evidence of the commercials that ran but I did get a Donny and Marie playset out of it, as I recall. I'm a big fan of most of the artists (I've written about my almost creepy love of Seonna Hong a few times) and think that it is beyond amazing that Scion Space exists. How many car companies sponsor emerging artists? I want to drive one of those boxy things one of these days! I loved his books too...if I were in LA, I'd be there.